She purrs like a kitten — a 32-year-old kitten, that is. This 1982 Honda Express moped has a new life on our farm, transporting our kids down country roads and back and forth to farm chores. 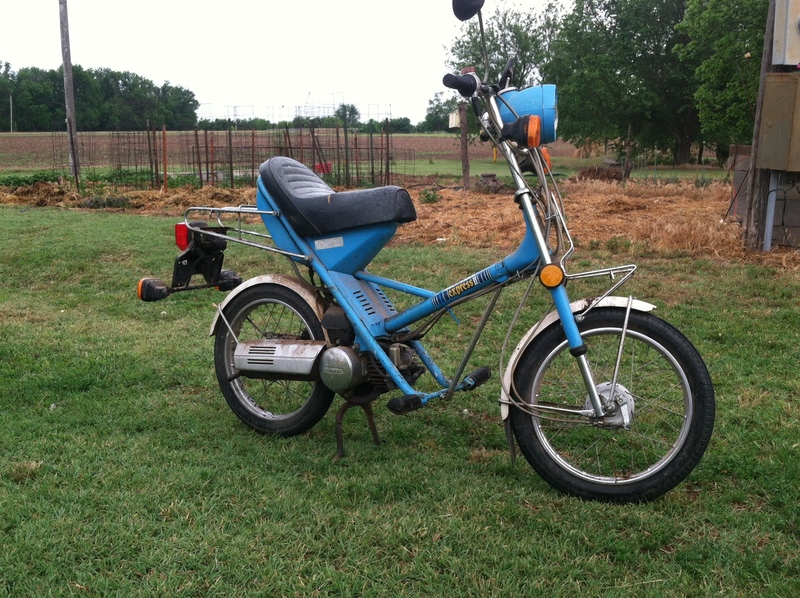 V. bought this moped while in college and tooled around Kansas State University on it and then back in our small town after college. It sat for a while and, with a little work, it’s back on the road again. A quick online search shows there are many similar models still on the roads or stored away in need of work. The Honda motorcycle corp. of Japan released the Honda Express (NC50) to the North American market in 1977. This new bike was designed to enter the large market for scooters that developed following the 1973 oil crisis. As such it came with a fuel-efficient single-cylinder two-stroke engine. It was also designed to be simple to operate, as many owners would be inexperienced with or intimidated by larger, more complex motorcycles. Honda accomplished this by using a fully automatic transmission and a small oil pump to self-mix the Express’s oil and fuel, thus eliminating the need for premixing. Its retro blue and tiny, electronic horn make this one fun, vintage ride.